Congratulations on your upcoming or recent Graduation! We would be honored to host a party to celebrate your success here at the 94th Aero Squadron! From open bar packages, to extended happy hours, to dinner buffets or prix fixe menus, we can offer it all in honor of the big day! 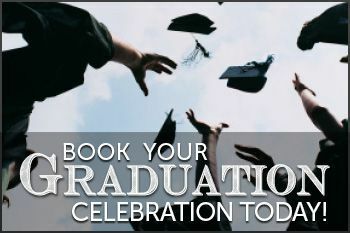 Whether it's a small gathering of close friends and family or a party for the entire class, come celebrate all the hard work you've put in! Contact us today to book your event! Email 94thaerosquadroncatering@srcmail.com or complete the contact form with your event details.